THE SUNDAY TIMES BESTSELLER WINNER OF THE JQ WINGATE PRIZE 2015 SHORTLISTED FOR THE COSTA BIOGRAPHY AWARD 'A gripping thriller, an unspeakable crime, an essential history.' JOHN LE CARRE Hanns Alexander was the son of a prosperous German family who fled Berlin for London in the 1930s. Rudolf Hoess was a farmer and soldier who became the Kommandant of Auschwitz Concentration Camp and oversaw the deaths of over a million men, women and children. In the aftermath of the Second World War, the first British War Crimes Investigation Team is assembled to hunt down the senior Nazi officials responsible for the greatest atrocities the world has ever seen. Lieutenant Hanns Alexander is one of the lead investigators, Rudolf Hoess his most elusive target. In this book Thomas Harding reveals for the very first time the full account of Hoess' capture. 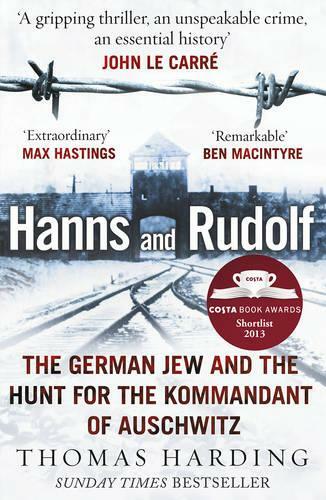 Moving from the Middle-Eastern campaigns of the First World War to bohemian Berlin in the 1920s, to the horror of the concentration camps and the trials in Belsen and Nuremberg, Hanns and Rudolf tells the story of two German men whose lives diverged, and intersected, in an astonishing way. I won this book in a Waterstones competition and it is an absolutely fascinating read! I'd highly recommend it.